Earlier this year I suggested a classroom activity in which students can scrutinize the evidence used to argue that the >5 million year old (mya) Ardipithecus kadabba was bipedal. To recap: Ar. kadabba is represented by some teeth, a broken lower jaw, and some fragmentary postcrania. The main piece of evidence that it is a human ancestor and not just any old ape is from a single toe bone, and the orientation of its proximal joint. In Ar. kadabba and animals that hyperdorxiflex their toes (i.e., humans and other bipeds when walking), this joint faces upward, whereas it points backward or even downward in apes. This “dorsal canting” of the proximal toe joint has also been used as evidence that the 4.4 mya Ardipithecus ramidus and 3.5 mya owner of the mystery foot from Burtele are bipedal hominins. A question remains, though – does this anatomy really distinguish locomotor groups such as bipeds from quadrupeds? STUDENT SCIENTISTS TO THE RESCUE! 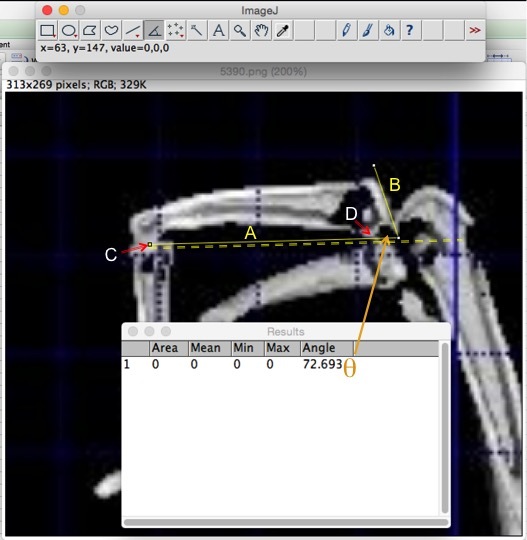 Use ImageJ to measure the canting angle between the proximal joint and plantar surface, as I’ve done on this Japanese macaque monkey (they are not bipedal). Proximal to the right, distal to the left Note I changed the measured angle from the March post. Dorsal canting angle of the fourth proximal pedal phalanx in primates. The lower the angle, the more dorsally canted the proximal joint surface. The “Fossil” group includes specimens attributed to Ardipithecus, Australopithecus and something unknown. Great apes have fairly high angles, meaning generally not dorsally canted proximal joint surfaces. The two gorillas fall right in the adult chimpanzee (adult) range of variation, while chimp infant and orangutans have much higher angles (≥90º means they’re actually angled downward or plantarly). The gibbon (Hylobates) is slightly lower than the chimpanzee range. The macaque has an even more dorsally canted joint, and the human even more so. The fossils, except the measurement for Ar. ramidus (see note above), have lower angles than living apes, but higher than the human and the monkey. 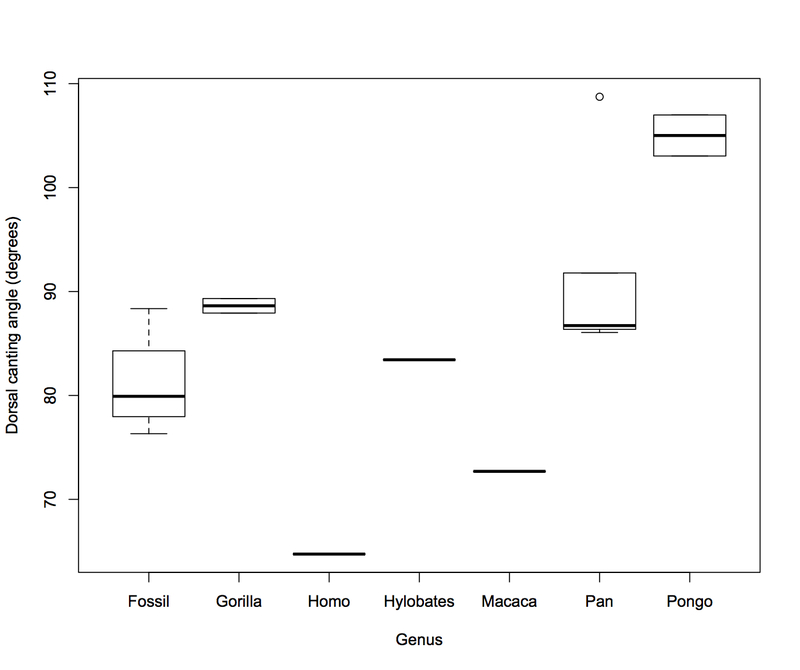 If dorsal canting really is really a bony adaptation to forces experienced during life, then the fossil angles suggest these animals’ toes were dorsiflexed more so than living great apes (but not as much as the single monkey and human). This lab helps students become familiar with CT data, the fossil record, taking measurements (students also measure maximum length of the toe bones and look at the relationship between length and canting), analyzing data, and hypothesis testing. You can also have fun exploring inter-observer error by comparing students’ measurements. Hey Zach. Thanks for sharing the idea for this lab. I really like it and plan to try it soon (with full acknowledgment of course). Any chance I can get access to the Moodle files?